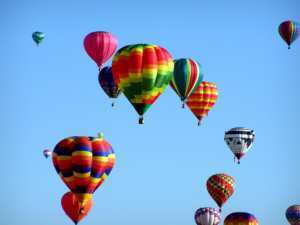 What do a Guest Ranch & a Ballooning Event have in Common? One wouldn’t normally think that a guest ranch vacation and attending the largest ballooning event on earth would have any common ground but in this case it does. Read on to see what Geronimo Trail Guest Ranch in New Mexico had to say in their recent blog post about this thrilling combined vacation opportunity. It’s Time for Albuquerque International Balloon Fiesta 2017! Are you planning a trip to the Albuquerque International Balloon Fiesta 2017 this October? If so, consider adding on a stay at Geronimo Trail Guest Ranch! We are located approximately 4 hours south of Albuquerque and still have availability during Albuquerque International Balloon Fiesta 2017. The Fiesta runs from October 7-17, 2017. There is nothing quite like observing the daily Mass Ascension as the sun brightens the horizon on crisp October mornings. When hundreds of balloons rise to dot the clear desert skies over Albuquerque it is truly a sight to behold. Balloons of all shapes and sizes also add a unique spin on the spectacle. Ask any New Mexican and they will tell you that autumn is one of the best times to visit New Mexico. The mornings are crisp and cool while the afternoons are warm with highs in the 60s and 70s with calm winds, perfect for ballooning! Had your fill of balloons at the Albuquerque International Balloon Fiesta 2017? Head on down to Geronimo Trail Guest Ranch for a mountain escape. Autumn is when the New Mexico wildflowers are at their peak after receiving all the summer rains. It is also elk season and you can often hear elk bugling at dawn and dusk. 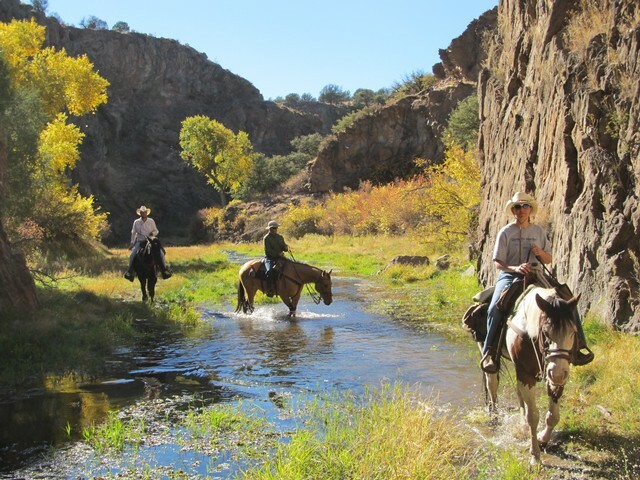 Let our horses guide you into the beautiful Gila National Forest. Ride through deep canyons, across crystal clear streams and atop mountain overlooks where you can gaze upon the brilliant fall colors. As you are planning your trip to New Mexico, check out our Area Attractions page. It includes some other New Mexico attractions our guests have enjoyed. Contact Geronimo Trail Guest Ranch today to book your Albuquerque International Balloon Fiesta 2017 adventure! When thinking of booking a guest ranch vacation horseback riding is what usually jumps to mind; however, aside from experiencing life from atop a horse there are always lots of other fun activities to choose from as well. Avid fishermen and ‘newbies’ to the sport may be surprised to learn that the fishing opportunities at several guest ranches is quite special indeed. The Ranch at Rock Creek is no exception. Situated in a pristine valley, this Montana guest ranch offers year-round vacations on an authentic 19th century homestead. With a capacity of up to 125 guests during the summer, accommodations range in size from one-bedroom suites to five-bedroom homes. Guests will also find themselves wowed by world-class ranch cuisine during their stay. If you are yearning to fill your days with exceptional fly-fishing then The Ranch at Rock Creek has the ideal 4 night 2017 Fly Fishing Adventure package just for you. For your non-angler travel companions a ranch ambassador will be on-hand to assist in planning a fun-filled vacation itinerary that includes other outdoor activities as well as time in the Granite Spa if so desired. Book a four-night stay between April 1 and June 4 or September 5 and October 31, 2017 and receive over $1,000 in additional value. Experience spectacular fishing and scenery on Montana’s best waterways. This special offer can be tailored to suit anglers of all experience levels. It includes daily casting lessons, a fly tying workshop, a complimentary full-day float and a complimentary off-ranch fishing excursion, as well as our standard all-inclusive amenities. Rates start at $1,800 per accommodation, per night based on standard occupancy, plus 20% Ranch Fee. Offer valid on new reservations only for travel between April 1 and June 6 and September 5 and October 31, 2017, based on availability. A four (4) night minimum stay is required. Offer is not combinable with other offers and promotions. Standard RC Inclusions: luxury accommodations; all meals; premium wine, beer, spirits and other beverages; a selection of gear and guided on-ranch activities; round-trip transportation to and from Missoula, Butte and Anaconda airports upon request. Be sure to mention that you heard about this 4 night 2017 Fly Fishing Adventure package first through RanchSeeker. From May through October join this family owned and operated Wyoming working ranch for a truly unique vacation and experience what a true western lifestyle is all about. With a maximum of 10 guests at a time guarantees that your vacation will entail a more individual experience. Immerse yourself in the day to day operation of the ranch as well as take part in various other ranch activities. Since the goal of the ranch is one of sustainability New Haven mimics the grazing behaviour of large migrating buffalo herds which historically roamed the prairies. This means lots of time in the saddle since frequent cattle moves are necessary. As well as working cattle on the ranch’s own property New Haven also works cattle on their neighbour’s properties. Here, you won’t find head-to-tail riding but rather more authentic horseback riding opportunities. When not moving livestock or checking reservoir fences you can learn how to rope, practice team penning or simply go on a scenic trail ride and marvel at the wide-open spaces and abundant wildlife. As each day passes you will feel as if you have traveled back in time to a simpler way of life. At the beginning of your stay you will be matched up with 2 horses both of which will become your working partner for the week and guests are encouraged to get involved in the training aspect as well. Riders must be at least 16 years old and physically fit and willing to learn in order to handle demanding work and terrain at times. Experienced riders will love the many varied challenging rides at New Haven. You might just find yourself climbing up a steep canyon wall, crossing creek bottoms or going after a stray at a full canter. Not to mention trying your luck at cutting in the arena, roping livestock and going on a night ride. Situated on the grounds of an old ghost town where over 150 years ago the first settlers, called “homesteaders”, came to the area, you will discover old buildings and machinery found all over the ranch. Life was difficult back then and the small farmers were up against a rough climate, down-and-dirty cattle barons, hostile Indian tribes and the depression of the early 20th century. Many gave up and left. Today you can explore the area and imagine what life must have been like so many years ago. At the end of the day settle into one of 5 comfortable rustic bedrooms in the lodge or bed down in the cabin. A furnace and wood stove will keep you warm when needed and central air conditioning cool on more humid nights. Soothe tired muscles in the outdoor hot tub and gaze upon a star studded sky or play a round of pool with fellow guests or simply kick back on the balcony with a view of the Missouri Buttes. Feeling adventurous? Ride your horse down to the lake and stay in a tipi for a night or two. Doesn’t that sound like fun? Feast on hearty home-cooked meals served buffet style in the lodge or ready packed for the trail. Weather permitting once a week guests are treated to a BBQ by the lake. Aside from horse related and working ranch activities guests can try their hand at pistol and rifle shooting or trap shooting. Also swimming/boating/fishing in and on the ranch’s lake as well as hiking and wildlife watching opportunities are available. Schedule permitting guests can even attend a rodeo, Western dances and horse sales. And you definitely won’t want to miss out on the ranch’s organized trip to Devil’s Tower during your stay. This summer book your vacation at New Haven Working Cattle & Guest Ranch and see why many guests choose to come back year after year. Riding the Range Cowboy Style! Almost everyone even remotely acquainted with western folklore is familiar with this refrain from a classic American folk song, “Home on the Range” written in the early 1870’s by Dr. Brewster M. Higley. Later on the original verses were slightly modified, set to music and recorded by various big-name singers, Bing Crosby being the first in 1933 and later by Frank Sinatra and Burl Ives. Home on the Range has since become the unofficial anthem of the American west and the State song of Kansas. This paen to a “cowboy’s life” also happened to be President Franklin D. Roosevelt’s favourite song. Home on the Range’s popularity with its images of the old wild west still resonates with die-hard riding enthusiasts and city slickers alike who relish the thought of a truly authentic western experience of long days riding the range, herding cattle and sleeping out under a canopy of stars. What could be more exciting to a real western aficionado or a relatively newbie to horseback riding than the adrenalin-rush of riding outdoors on the range, honing equestrian skills and the joy of living a dream. The good news is that this isn’t just something to dream about since various working ranches offer a limited number of guests the experience of being part of the daily ranch routine of actively riding the range, moving and herding cattle under the expert guidance of family owners and ranch hands. One such ranch is Horses N Courage, which warmly welcomes guests to its Big Sky back-country spread at Sawmill Canyon south of the Snowy Mountains in Martinsdale, Montana. Horses N Courage is a rustic working guest ranch which truly evokes the spirit of Home on the Range, owing to the deer, elk and antelope population along with moose, coyotes and bears that inhabit their breathtaking 2,000 acre private range land with its wide open pastures, rolling hills and high mountain views. Family owned and operated by Kent and Sarah Hereim since 1997, this working cattle ranch offers 4 day/3 nights riding packages, consisting of range riding on the property of up to 6 hours daily in the saddle according to comfort level and expertise, herding or moving cattle across different terrains and streams. In addition, there is hiking, wildlife photography or soaking in the nearby White Sulphur Springs. You can also practice dummy roping skills. The ranch can accommodate up to 8 guests in four comfortable tents, each containing two cots, sleeping bags, warm blankets, lantern, table, chair and wash bowl. An immaculately clean outdoor toilet and shower are close at hand. Hearty down-home meals are ranch-prepared and eaten in a communal dining tent. At night, a campfire and ‘smores add to the western ambience after a hard day in the saddle before tumbling into bed in your cosy tent. As a BYOB ranch, guests are advised to bring their own alcohol and that smoking is not permitted in tents or on the trails. There is no wifi or cell phone access thereby providing an “off the grid” break from the cares of normal city life to better focus on the spectacular Montana surroundings and a chance to truly reconnect with nature. Guests are welcomed at Horses N Courage ranch during the beautiful Montana summer months when the weather is usually warm, dry and sunny. Rustic Working Ranch Riding Vacations are offered on these dates, June 28 – July 1st (8 spots available) and August 24-27 (4 spots available). For more information please contact the ranch about this and other innovative packages available. Horses N Courage Ranch provides extensive range riding activities and outdoor camping for a really different, fun kind of ranch vacation. No frills but plenty of thrills! Written for the musical, Paint Your Wagon in 1951 by Alan J. Lerner and Frederick Loewe, this beloved western song exemplifies the spirit of a roving cowboy, always saddling up and moving onto someplace else, such as New Mexico, where the next working ranch is located. Known for its dramatic landscapes of plains, mountains, plateaus and desert grasslands, it’s not difficult to understand the impact New Mexico had on the renowned English novelist, who made Kiowa Ranch in Taos (now known as the D.H. Lawrence Ranch and a popular tourist attraction) his home during the early 1920’s where he wrote The Plumed Serpent. Burnt Well Guest Ranch lies in the foothills of the Sacramento Mountains at an elevation of 4,200 feet, about 40 miles from Roswell, the city of UFO fame, in the sunny arid climate of southeastern New Mexico. Burnt Well has a long and colourful history of cattle breeding that goes back to the family’s patriarch, Ivan Chesser, who purchased the property in 1950. Current owners and operators are his son Kim, wife Patricia and their 3rd and 4th generation family. The Chesser family are so passionate about ranching and their way of life, it prompted them to open up the ranch in 2002 to guests wanting to immerse themselves in the lifestyle and daily operation of a working ranch. The ranch mainly uses quarter horses and not a regular dude string. Avid horse riders will be pleased to learn there is no nose to tail riding at Burnt well. Open pasture riding is the norm, unless you opt for a mountain trail ride for your day trip during the 6-day package. Overnight campouts are available as are all types of cattle work depending on the season. Riding and roping lessons are offered to interested guests. Cattle drive packages are the crème de la crème for physically healthy, adventurous adults, who love to ride, sleep out under the stars, rough it a little and take home never-to-be-forgotten bucket list memories. This year’s Chisum Challenge Cattle Drive is from October 2-8, 2017. For details, please refer to the ranch website. Ranch dining is good, wholesome food, be it Mexican-themed fare or lots of “cowboy cuisine” such as brisket, chicken fried steak, grilled steak, lamb chops and plenty of country-type cooking served family-style in the main ranch house or outside around the campfire. The meat served at Burnt Well is Chesser’s own natural beef and lamb….all superbly prepared by Patricia, who can sometimes be persuaded to entertain guests after dinner with her fiddle playing. Occasionally, local musicians are on hand to add to the general merriment. Guest ranch lodging consists of a comfortable hacienda containing two bedrooms each with its own private bathroom; one bedroom can accommodate a family of 6, the other a family of 4. There is also a great room, pool table, kitchenette, laundry room, separate bath & horse trough shower (called the privy) and a hot tub on the porch. Guests are allowed to bring their own beverages to consume on the premises. Burnt Well Guest Ranch is open all year to guests and exudes typical western hospitality with generous, caring hosts who strive to make their guests feel like family. The ranch offers an exciting array of daily riding activities, packages and the chance of a lifetime to participate fully in the general routine of a genuine working ranch in beautiful New Mexico. Both of these working ranches offer exceptional opportunities to realize a truly special dream vacation where you get to enjoy a hands-on experience of what a working cowboy’s life is all about and if you’re really lucky, you might even catch a glimpse one moonlit, starry night of galloping ….♫Ghost Riders in the Sky…..♫ and the sound of….. ♫Yippie yi ooh, Yippie yi yay…..♫ fading into the distance as you fall blissfully asleep. Let RanchSeeker help you find your next vacation! Are you looking for a Montana Wilderness Adventure for your next vacation? Well, look no further then since Hawley Mountain Guest Ranch has it all! Situated in the middle of thousands of acres of untouched, pristine wilderness, just north of the Yellowstone Park, this Montana guest ranch is where you can enjoy a vacation away from the distractions of everyday life. Come explore and discover exhilarating mountain wilderness experiences, spectacular scenery, wildlife and western cowboy culture. All meals, lodging, and activities (including fly-fishing and riding instruction) are included in their all-inclusive low rates. With a variety of activities available you just might learn a new skill while on your vacation this year. Mountain Hiking: Go guided and unguided to explore unspoiled natural environments. Your travels will take you through mountains, lakes, caves and much more. Explore Ghost Towns: Take a jeep trip to Independence, famous for its gold mines and ghost town. Campfires and cookouts: Enjoy some hearty western meals while sharing the campfire and some spooky stories with other guests. Explore an Archeological site: This one date’s way back 11,500 years. See our history, well-preserved! See some Wildlife: Elk, moose, coyotes and even bears walk free through these parts. Can you spot some? River Float: When you need a change of scenery why not choose to float down the scenic waters of the Yellowstone River west of Big Timber? This activity is fun for the entire family. At the end of the day a comfortable bed and warm shower await you in either one of the ranch’s cabins or lodge rooms. In the Eagle Nest Lodge, which is perched high atop a 300 foot cliff, you will find a roaring fireplace, and big deck outside where you can take in the breathtaking beauty of the mountainous river valley. Mealtimes at the ranch always include hearty, western meals served buffet-style as well as homemade bread and desserts, served three times a day! And if the weather cooperates you will be treated to two cookouts during your stay. Sometimes lunches are out of a saddle bag on a day trips but no matter where your meal is served the food is always great. For those feeling peckish in between mealtimes there are always cookies, fresh fruit, and drinks available in the lodge. So what are you waiting for? Hawley Mountain Guest Ranch is the ideal vacation choice for you if you are looking for a place with quiet solitude and breathtaking scenery. Leave your everyday worries behind and experience true warm western hospitality and unique outdoor adventures balanced with a peaceful and tranquil atmosphere. It’s Spring Time at the Ranch! As winter slowly slips away and slushy snow still drips down city drains, thoughts of spring eagerly come to mind with its promise of warmer days, trees blossoming and newly-born lambs and foals gambolling among wild-flowered meadows. And nowhere could it be better or more beautiful than at a guest ranch to welcome this time of hope and rebirth and experience the wonders of a seasonal shift, which calls to all of us on some ancient primeval level. A spring break vacation is the ideal time to give way to all these feverish yearnings and dare to do something different, unexpected and exhilarating by heading off to a guest ranch with your family or loved one, friends or fellow students to satisfy that inner wish, that ache to feel gloriously alive at this time of awakening and renewal. To become totally aware of your existence in the here and now with a giddy, heady sense of anticipation of exciting things about to happen as you herald the advent of spring. A guest ranch vacation is guaranteed to fulfil all the senses; that joyous feeling of well-being and sudden adrenaline rush as you try something new or perhaps do something you already love, such as exploring the neighbouring terrain of a ranch by horseback and drinking in the breathtaking landscape vistas that Mother Nature so generously provides. A guest ranch vacation is a golden opportunity to have adventurous fun-filled days, whether riding the trails, tubing, rafting and hiking or taking advantage of the many other activities that guests can enjoy when not in the saddle. The cheerful camaraderie of mingling with other guests at dinner and afterward…. the utter bliss of sleeping deeply and well within the quiet peacefulness of the ranch property after a healthy day spent outdoors. The following guest ranches are just three examples of the many ranches situated in stunning locations ideally suited for that super-special spring break vacation that will satisfy your heart’s longing to do something truly out of the ordinary this coming spring. The White Stallion Ranch in Tucson, Arizona is proud of being awarded the No. 1 spot out of 129 properties in the area for six consecutive years. This well-known, spectacular 50 year old ranch of Hollywood fame is set in unspoiled desert, cacti and rugged mountainous terrain and is the perfect place to enjoy a memorable spring break vacation. Owned and managed by three generations of the True family, this traditional dude ranch is carefully blended with the service and amenities associated with a fine resort. In addition to its exceptional riding program and varied trail rides designed to suit adults and children at all skill levels, the ranch also offers an array of activities such as rock climbing, hiking, a weekly performance rodeo, tennis, basketball, swimming, rec room games and a movie theatre plus evening entertainment and a bar. Children in particular are encouraged to experience the freedom and love of nature, with access to many outdoor physical activities and a petting zoo. White Stallion Ranch provides a variety of delicious meal options to please most palates with a cooked-to-order breakfast menu and continental-style buffet. Lunch and dinner buffets satisfy hearty appetites with an appetising array of dishes. Tasty snacks and hot and cold drinks are available throughout the day. White Stallion Ranch is a one-of-a-kind ranch resort, especially at spring time when the desert daytime temperature is refreshingly cool and fragrant. Coffee Creek Ranch , founded in 1900, is surrounded by a beautiful National Forest and the Trinity Alps wilderness area in Northern California and sits at an elevation of 3,068 feet. The guest ranch exudes a taste of southern-type hospitality and old west culture with an expansive list of amenities to entertain guests along with its unparalleled horseback trails. Owing to its wilderness location, Coffee Creek Ranch is an ideal vacation for those wishing to reconnect with nature and “get off the grid” since the electricity is ranch-generated and switched off between midnight and 7.00am. Boasting a “a real cowboy experience” as one happy guest wrote, there are two rides per day divided by ability level with access to 510 miles of stunning true wilderness scenery. Amenities include a swimming pool, hot tub, fitness center with gym/workout room and a bar/lounge area. The adjacent Coffee Creek is an excellent fly fishing stream for trout and tubing expeditions. Hiking and mountain bike riding in the wild Trinity wilderness can be arranged for the more active guests. Additional activities include badminton, volleyball, horseshoes, table tennis, pedal boating or basketball. Guests can also test their skill at the archery and rifle range. Accommodations consist of 16 spacious, rustic and comfortable cabins; food is ample, fresh from the garden and superbly prepared by Ruth, owner and chef of Coffee Creek Ranch. 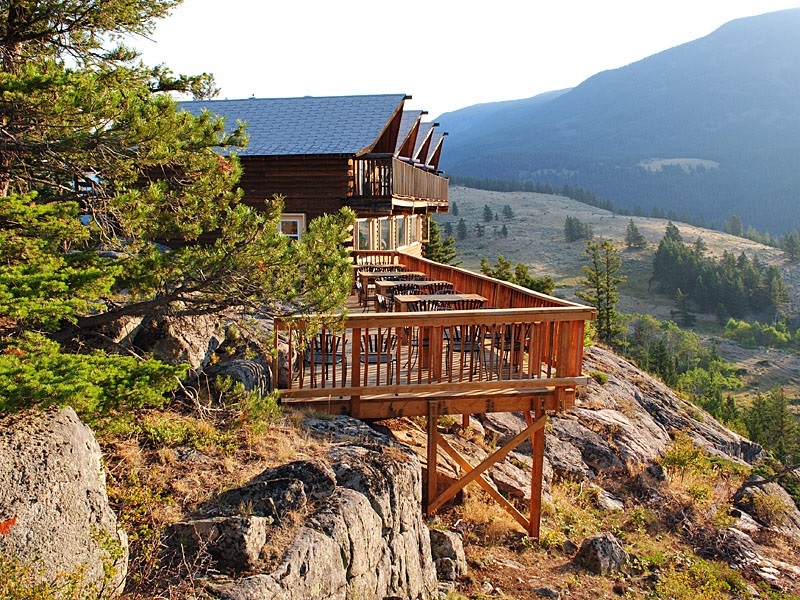 The Coffee Creek guest ranch offers a unique opportunity to visit an outstanding protected wilderness area with all the comforts of home. Sundance Guest Ranch is close to Ashcroft, the site of many a western movie, in ‘Supernatural Beautiful British Columbia’ among sage-brush speckled high desert hills and sandstone hoodoos just 4 hours from Vancouver, Canada. The ranch has a herd of over 100 well-groomed horses for daily trail rides to explore the semi-arid desert terrain and sprawling valley grasslands. Horse and rider are carefully matched to optimize each guest’s riding experience. Other outdoor activities include sunny decks, heated swimming pool, an authentic horseshoe set, walking and hiking trails. Indoors, there’s a games room, billiards room and a movie lounge to add to guests’ enjoyment. And yes, a registered massage specialist is on hand to soothe away any aches and pains. Dining is a special event at Sundance and the food doesn’t disappoint starting with the breakfast buffet and daily morning specials, such as eggs benny and French toast and after that to set menus for lunch and dinner of maybe classic charcoal-grilled steaks and hamburgers to more sophisticated international cuisine. The dining room is licenced with a fine wine list and overlooks the pastures where the horses graze at night and gallop freely….truly a sight to behold, photograph and cherish. The ranch has an adults-only BYOB lounge for after dinner socializing, especially on a Friday or Saturday night, the place of some legendary parties, and a weekly country-rock DJ dance every Saturday. Accommodations vary from well-maintained standard to king size rooms and come with private full bathrooms, air-conditioning and comfortable beds. All the rooms are on one level and accessed by a covered boardwalk. Sundance Guest Ranch is a highly recommended and very popular Canadian guest ranch destination for an unforgettable adventurous spring break vacation. So…. dust off your riding boots and cowboy hat and make plans to celebrate this year’s spring break at an amazing ranch locale whether it’s the Arizona desert, the high North Californian wilderness or the picturesque semi-arid interior of British Columbia. Located in Red Feather Lakes, Colorado you will find Sundance Trail Guest Ranch a family owned and operated ranch 100 miles NW of Denver. Open all year round this ranch is ideal for your next family vacation and offers dude ranching at its best. Fall, winter and spring are Bed & Breakfast Mountain Lodge seasons at the ranch where you will find lodging, meals and morning horseback rides. These times of year are a bit quieter than the more activity packed summer months. Guests are welcome to come for one or two nights, or for a week and during these months the ranch is also pet friendly. Be sure to ask for the ranch’s list of “common-sense rules” and “Special Notes” regarding your four-legged family members. During this time period guests enjoy a quiet retreat away from the hustle & bustle of everyday life. Some couples find this to be the perfect romantic guest ranch get-away for elopement weddings and the ideal destination for a honeymoon. Fill your days horseback riding the trails of the Roosevelt National Forest, indulging in an array of spa treatments, stargazing from the Jacuzzi, swapping stories in front of a Colorado Mountain Lodge fireplace or simply enjoying a great book on a sunny porch. If you ae traveling as a group of between 8-12 people the ranch can arrange Country Inn Murder Mystery Weekends. What fun! and for little ones children’s programs. Accommodations include cozy mountain lodge and cabin suites for up to seven families or twenty-four guests. Mealtimes at the ranch are always special whether it’s cookouts, steak barbecues, lunch on the trail or picnicking under the pines. The ranch serves up excellent fare. Meals are Colorado hearty western, served family style, with home- made breads and desserts… always delicious. If you have any dietary restrictions the ranch kitchen is always very flexible and happy to accommodate with advance notice. So as you can see no matter what time of year you choose to getaway Sundance Trail Guest Ranch can meet your vacation needs.